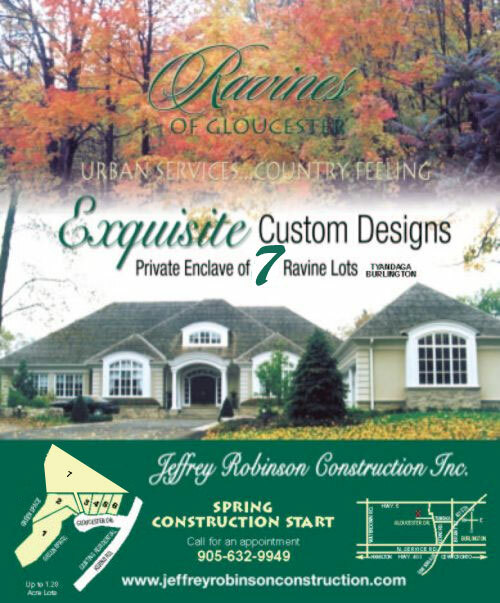 Custom luxury home design and construction - Jeffrey Robinson Construction Inc.
For further information about the Ravines of Gloucester lots, contact us. 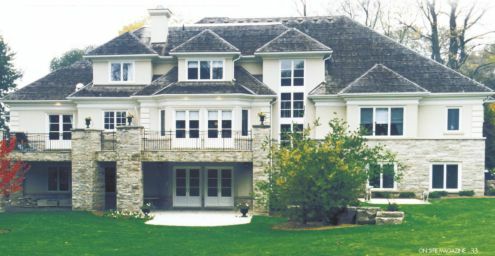 For over 25 years Jeffrey Robinson Construction Inc. has been bringing people's dream homes to life by creating unique and innovative custom homes. A hallmark of a Jeffrey Robinson home is its exquisite design, attention to detail and exceptional quality. Now this premier custom homebuilder is giving homebuyers the opportunity to live in one of the most picturesque areas of Burlington, in a ravine setting, with the release of The Ravines of Gloucester. 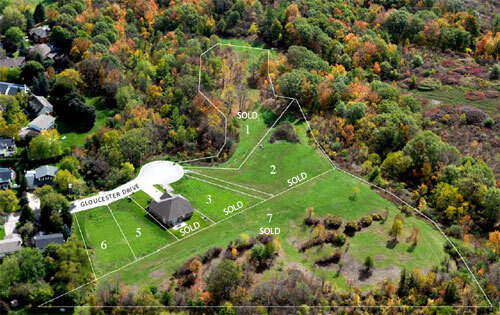 Featured at The Ravines of Gloucester is a private enclave of six lots, varying in size and shape, located next to the well-established Tyandaga community and near Kerncliffe Park. Gloucester residents will be able to enjoy a tranquil setting and the soothing sounds of nature as the enclave is almost entirely surrounded by ravines and escarpment woodlands. Homebuyers can be assured that the natural beauty of this picturesque setting will be preserved as the surrounding woodlands have been dedicated to Conservation Halton and the City of Burlington. Homebuyers also have a great deal of freedom when it comes to their homes as the lots are generously proportioned, with sizes going over an acre, and widths starting at 60-feet. And since these homes are custom-built, the only obstacles you should face in building the home of your dreams are perhaps imagination and budget. Jeffrey Robinson Construction will help you obtain the home of your dreams through a very personalized approach to customer service by working with you one on one throughout the design and planning stages. To maintain their excellent level of customer satisfaction and to honour their commitment to quality, craftsmanship and attention to detail, Jeffrey Robinson Construction takes on fewer projects. It's this business philosophy that has earned the company an excellent rating with the Ontario New Home Warranty Program since 1976. For an appointment call 905-632-9949 or to see Jeffrey Robinson?s portfolio of homes visit his Web site at www.jeffreyrobinsonconstruction.com. Premier custom homebuilder Jeffrey Robinson Construction Inc. is giving homebuyers the opportunity to build their dream home in one of the most picturesque areas of Burlington with The Ravines of Gloucester. Surrounding wooded lands have been dedicated to Conservation Halton and the City of Burlington to ensure the natural beauty of the Niagara Escarpment is not disturbed.